It’s hard out here for a hiker – and it doesn’t look like the wildfires (and subsequent hazes of smoke) are going away anytime soon. So even though we are going to send you a little bit further from home than we have of late, we still want to caution you to please check for fire danger before embarking on ANY hiking trip. • InciWeb, an intergency all-risk incident management system designed both to provide the public with a single source of incident related info as well as a standardized reporting tool for the media. 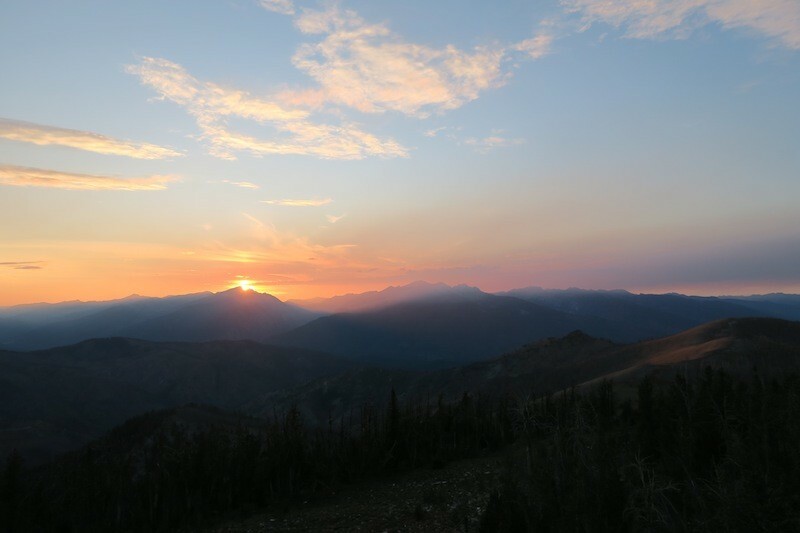 • The Missoula County air quality website, which has maps that can help you pick out a better destination (say, a few hundred miles east of here) for your outdoor adventures. Directions: From Missoula, head south on Highway 93 about 34 miles past Hamilton to the junction with Laird Creek Road/Forest Service Road 370. Turn right there and continue another 4 miles to Bear Creek Saddle. There you will turn north onto Forest Service Road 5731 and continue 2 miles to the trailhead. What to expect: This trail starts uphill immediately and never really lets up for the 3.6 miles to the lookout. Initially it alternates between forested sections and those recovering from fire, but the latter half is mostly through burned sections. Consistency is a virtue, and this trail is nothing if not consistently uphill. A few sections are steep, but for the most part it is just a continuous grind at a moderate grade. Route-finding isn’t really a concern – and the few cairns are helpful but not entirely necessary. The trail reaches the ridge and junction with Shook Mountain Trail after 3.4 miles and the lookout is a merciful 0.2 miles further. The views from the ridge are terrific, and are even better from the catwalk of the lookout. Note: There is a fee to spend the night in the lookout; you can reserve that HERE. Also, there is no water available on the trail, but the logbook in the lookout describes routes to two separate springs.